Beth joined the firm in 2005 as our Business and Group Employee Benefits Manager. She is a graduate of Whitworth University and that is where she and Paul first met. They have been married since 1978! Beth works with business owners assisting them in their search for excellent employee benefits (medical, dental, vision, life, long & short term disability, voluntary benefits, flexible benefit plans, spending accounts and “premium only” plan set-up). A licensed insurance agent since 1997, Beth also brings a wealth of experience to this role due to her 25-year career as a Human Resources executive with Providence Health Services in Spokane, including Sacred Heart Medical Center and Holy Family Hospital. Because of her background in HR, she brings a unique perspective from the employer’s point of view to her role at the Viren Team. 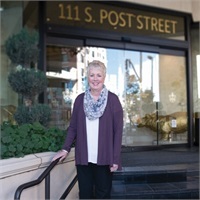 She prides herself in providing superior customer service, acting as a team member with her employer groups striving to find top quality employee benefits while meeting the employer’s company goals and budgeting concerns, and staying current in the ever changing landscape of health insurance. She enjoys any opportunity to spend time with her family and friends, travel opportunities, and pursues her creative side as a jewelry artist. You can reach Beth by emailing her at [email protected] or by calling our office at (509) 462-0747.